Note: It seems like many people read this article and took away from it that everyone should be able to travel overseas or take big, expensive trips. In no way is that the intent. Touring of all kinds is important, and local touring is likely the most beneficial. Last week, 93 college aged men in the University of Kentucky Men's Chorus crammed into two motor coaches in dress clothes (and tuxes in tow!) to travel to nearby Louisville, KY for a day of touring. Now, the UK Men's Chorus is one of the most renown collegiate men's choirs in the country...so why did we spend 14 hours performing multiple concerts in a nearby city? Touring makes your music better. We have all heard or said that a single performance is worth (enter large number here) rehearsals. Imagine if those performances are all within a single day-- focused, with only hours or days between each. This is what you get with a tour. If you are doing a single day tour, consider having a combination of formal and informal performances. Some informal ones may just be in a classroom at a high school or middle school. Others may be in a public place like a mall or shopping center. Formal performances could include a church, school, or performing arts center. Regardless, you may find it easier to build an audience if you do a joint concert with a local ensemble. This brings me to my next advantage. Whether you have a college group and you are performing for high schoolers, or you are an affluent suburban school connecting with a Title I urban school, realizing that music binds all of us is one of the best benefits of touring. I will never forget going to an inner city high school with my college chamber choir and hearing a national ACDA caliber Title 1, urban choir perform a cappella in their cafeteria. It remains to this day one of the most stunning performances I've ever experienced. Younger, elementary and middle school aged students can be inspired by performances from high school and collegiate ensembles. You never know when you are going to change some young persons life and give them that final push they needed to join the band, choir, or orchestra. Touring builds relationships within the group. Hours in a bus, airport, van, or hotel provide opportunities to develop relationships between members of the group who may not otherwise interact. Directors can really get to know their ensemble members, and often learn interesting and insightful details about their lives. An added benefit of this is that your students can see you more as a real person, and not some mythical figure who swoops in for a rehearsal every day. Touring builds your brand.There is hardly a better way to recruit, advertise, and advocate for your program than touring and performing in front of captive audiences. Touring broadens horizons. Travel opens minds, and that is particularly true for ensembles performing in foreign countries. While international travel is definitely expensive, it can be a life-altering experience for so many. 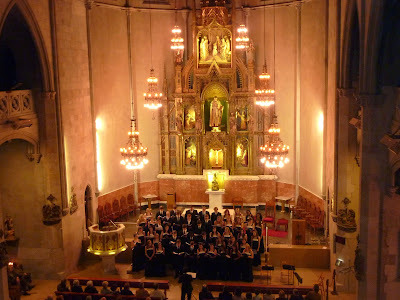 My choirs go on an international tour every three years. This gives them the chance to save money, plan, and successfully participate in the tour. For high school or college students, touring internationally once every three years provides at least one, if not two chances for a student to go in their four years at the school. When my high school choir students were in Spain this past spring, they were very nervous about an exchange day we were going to have with a local Spanish high school. The school had never had a choir before, and they wanted us to perform for them to inspire their students. The concert itself was a huge success, as the entire student body excitedly talked, gasped, exclaimed, and recorded throughout it. Afterwards, the Spanish students hosted our students for lunch at their homes (yes, they really do get 2 hours for lunch!). The pairing off of American to Spanish students was an awkward and hesitant process, but by the time we got back, they had all exchanged contact information and became good friends. 5. Touring forces performances in a variety of venues. Sometimes you have to perform in a middle school gym. The performance challenges presented by that kind of venue are unique and demanding. However, they will make your ensemble grow and play or sing in a better way. Similarly, a performance in a cathedral with 4 second delay can be a transformational experience for choral ensembles, specifically. What else do you find that your group gains from touring? What's your favorite touring memory? Share them in the comments below!